Women flock to him...but he only has eyes for one. Max Frazier, international rock star. Tall, brooding and delicious he is much more than he appears. The world is his oyster, and Max knows each and every pearl is his for the taking. Ashleigh Thomas is rich, filthy rich. Money means nothing to her. Work is her life. With the death of her husband, Ashleigh has thrown herself into her entertainment agency, and Max. A set of unusual circumstances throw the two together and Ashleigh finds herself in a world, until now, she'd only read about. Will she allow Max to lead her into temptation and ultimately submit to Max... or is her stubbornness and independent nature too much for even Max to tame. The next book in the Brighton Cove series. Delve into Meg's story in this next book. novels for one low price! When your name is Apolo Choice, choice is a way of life. Failure is not in the vocabulary of this self-made billionaire. Enter Caitlyn White and his choices take on a new meaning. His lifestyle in private, however, could expose them both when he chooses to enter the political arena. And the paparazzi wants to make sure their private choices become public knowledge. Can Apolo and Caitlyn survive the firestorm? Will they rise above to achieve their hopes and dreams for the country and themselves? Find out in Choice Matters, Choice Affairs, and Choice Desires, the first three books in the Southern Heat series. Also included in this bundle is the special Christmas novella, Choice Christmas, where you'll be charmed by a little Irish lass by the name of Briana. Who is she? You’ll have to read to find out! Available in eBook & Print! He had the fame, the fans and the money … but lost it all. An aging rock star struggles to deal with unexpected changes in his life, including an explosive secret from his troubled past. 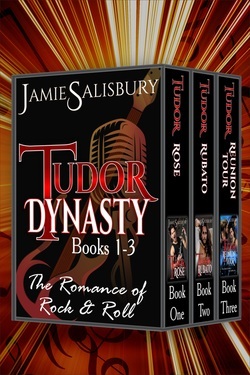 Damien Tudor, oldest brother in the famed Tudor dynasty, had his turn in the spotlight with his band Ripp Tyde. Then health problems and an ugly divorce stripped him of everything. Slowly, he's rebuilt his life. He has a state-of-the-art sailboat to ply the waters of Puget Sound, and two beloved daughters, Courtney and Brittney. But he's restless, ready to build a new life for himself. Should he dare a career come-back … or settle into maturity managing new, younger talent? Damien gathers material for a new solo album of his own, music that could be his best ever. Then an old love, Beth Asher, reappears with a secret from the past that will blow apart everything Damien thought he knew about his life. But he must cope as rising rock star Ethan Maverick asks to sign on as his first client, and his toxic ex-wife reappears, searching for ways to discredit Damian and push her own career. What will all this mean for Damian's yearning to step back into the spotlight? Will life slip through his fingers again … or can this rocker find his redemption?